The primitive man wandered through forests in search of food to satiate his cravings and I suppose it’s the same primal instinct that makes the modern man wander through concrete forests searching for delicious quick bites in order to satisfy his hankering. 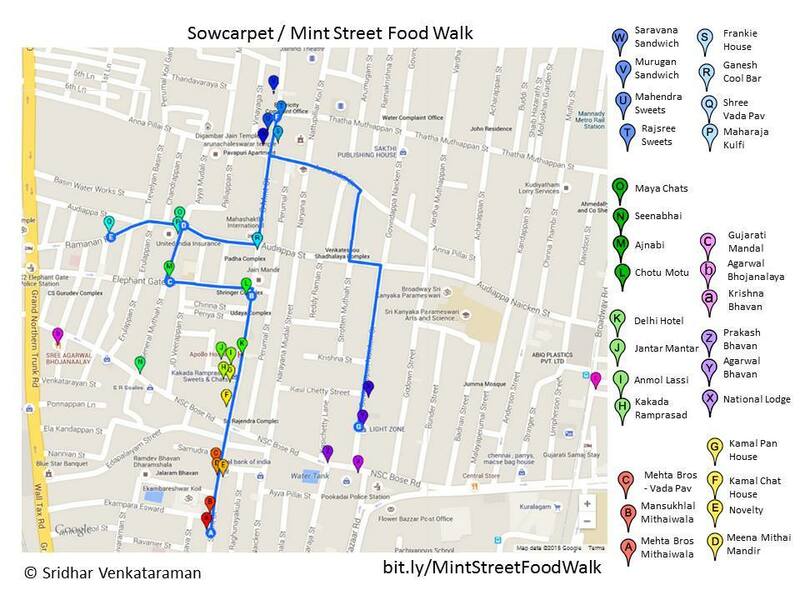 This is the essence of a food walk and as far as Chennai is concerned, Sowcarpet is the Mecca for food walks. Sowcarpet is the most tried and tested place for these walks and thanks to a number of foodies who are seniors and predecessors in this topic, we were able to plan our trip perfectly and we executed it flawlessly. 1. Parking is a huge issue during weekdays but not a problem on a Sunday morning in the Sowcarpet area. You can drive your cars through those narrow streets and you would be able to find a sidestreet where you could park. Alternatively you could park near the Flower Bazaar police station and walk down too. Just be aware of the one way roads in the area. Mint Street is one way starting from PH Road going north. If you are riding a 2 wheeler, you can find parking everywhere. 2. If you are taking a suburban train, get down at Madras Fort station and walk just over a kilometre to the starting point. (Frazier bridge road -> Rasappa Chetty St -> Right onto Mint St). The ambience on the streets may not be great. Just be prepared for the walk. 3. If you are taking a bus, Flower Bazaar police station or Broadway/Parrys/High Court are the points that you can get down and walk to the starting point. Walk on NSC Bose Road and turn left into Mint St.
Apart from the fact that the space in our tummy isn’t as large as we wanted it to be, we filled whatever little space there was with some delicious food and drinks. Given below is my experience from trying some of the best and must try eateries in Sowcarpet. 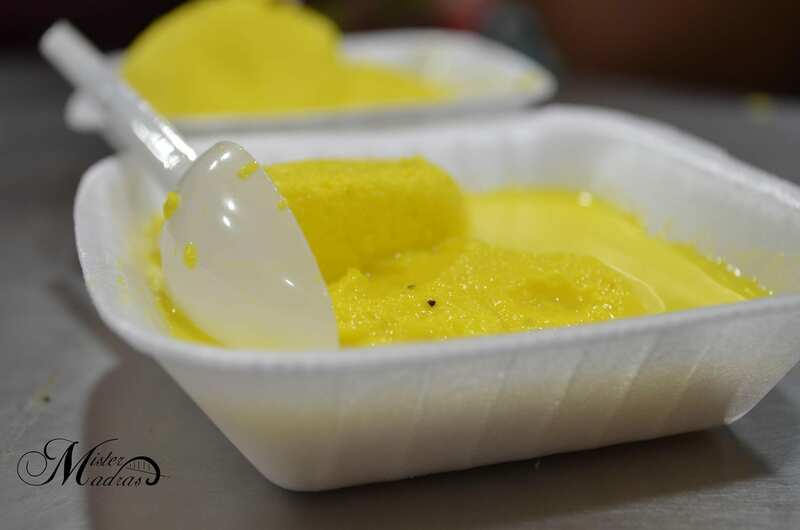 If there’s one place that one would like to try that would give them the entire taste of Sowcarpet, Kakada Ramprasad is the place to go. 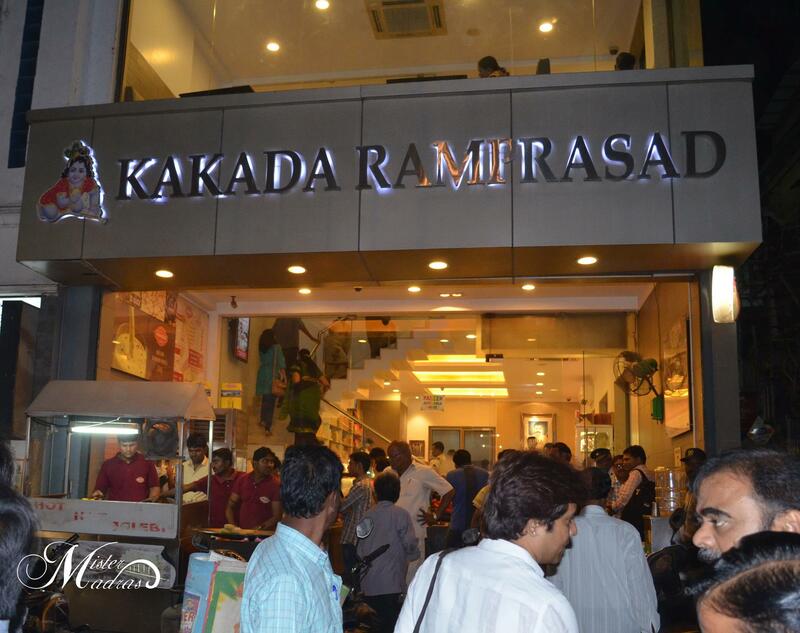 Renovated and looking like an oasis in a barren desert, Kakada Ramprasad is famous for it’s collection of North Indian street food items. There is an open counter at the shop’s entrance from which one can get the chat items and once inside, there is a plethora of sweet and savoury items to choose from. There is seating upstairs where service is available at the table. Most importantly this is where there is an availability of air con. Though this is the first stop for the evening, wading through the busy mint street and getting here itself would make most of them take a break. Not to mention the crowd and blistering sun, a breezy welcome is definitely a blessing in disguise. We ordered a Dahi Papdi Chat and a Pav Bhaji which was served in no time. 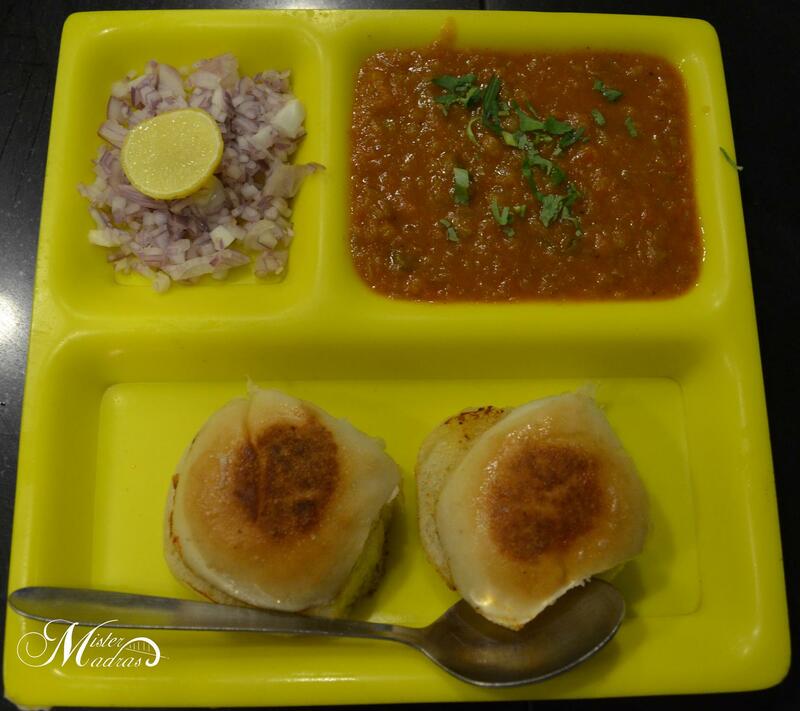 Dahi Papdi Chat was really good but Pav Bhaji took the ‘Best dish of Kakada for the day’ award. 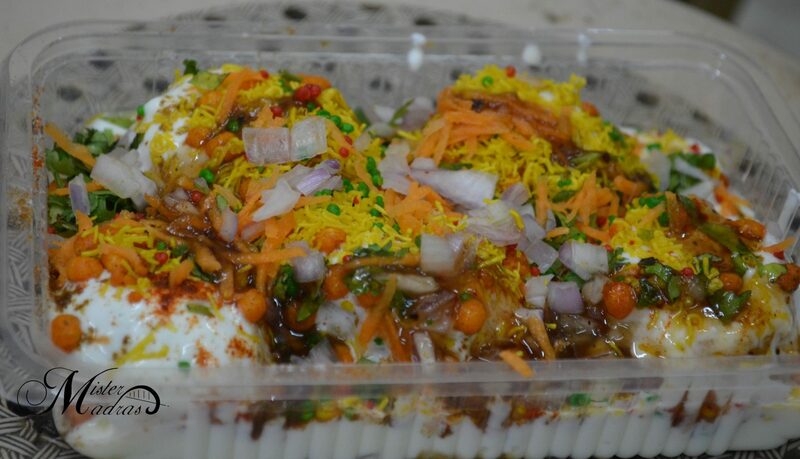 Dahi Papdi Chat is priced at Rs. 60 and Pav Bhaji at Rs. 85. After taxes, the grand total amounted to Rs. 156. 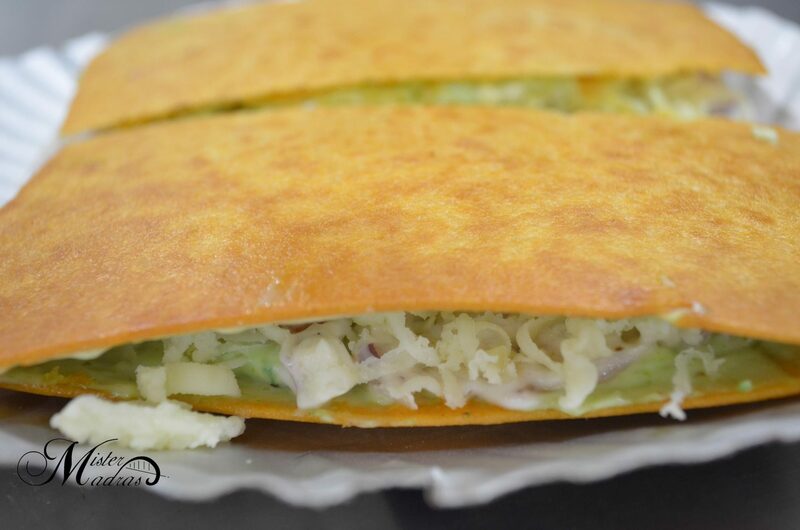 Yet another not-to-miss destination, right next to Kakada Ramprasad is Anmol Lassiwala. If one isn’t intimidated by the owner’s stature, this will easily be one of the best Lassis in Chennai. 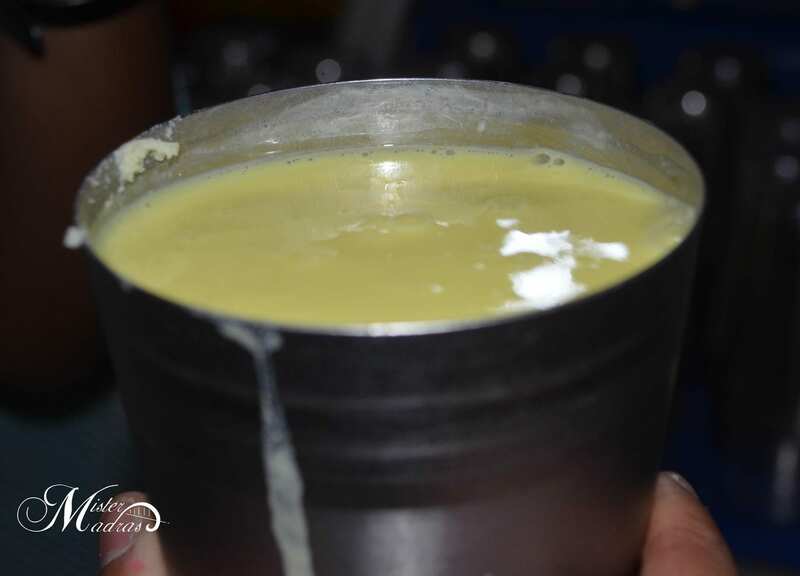 We tried a full glass Kesar Lassi and it was super refreshing. It costed Rs. 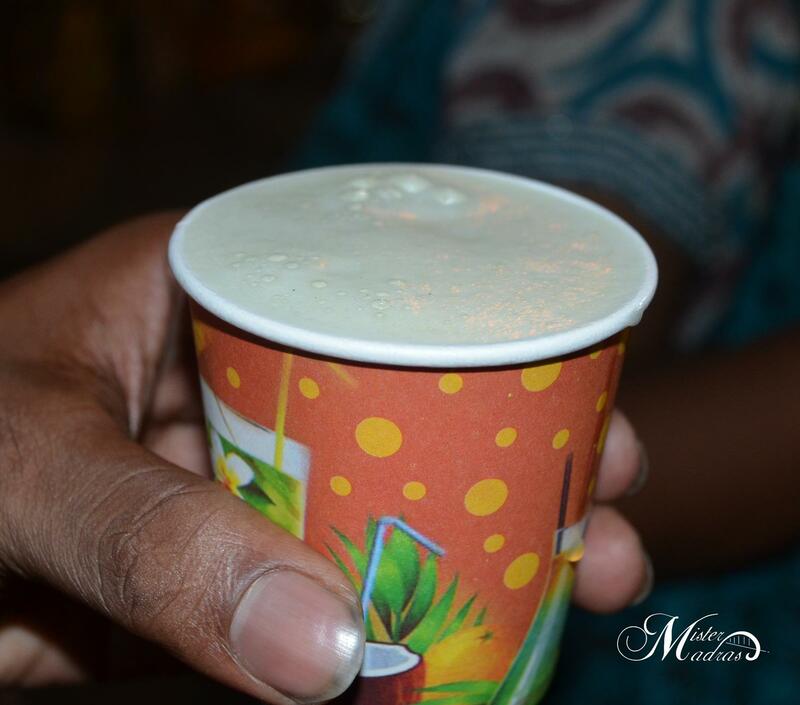 140 which is definitely on the higher end but that said, this lassi is brilliant. The container itself is huge and it’s impossible for one person to finish it. Since we were a group of four, we slurped it dry in no time. Proprietor Mr. Dinesh Soni, a professional wrestler from Rajasthan, justifies the price tag by saying that he uses only packaged purified water. Considering the fact it’s at a junction, there is a decent amount of bike parking space. As it’s an alleyway, there is some bike parking space available. 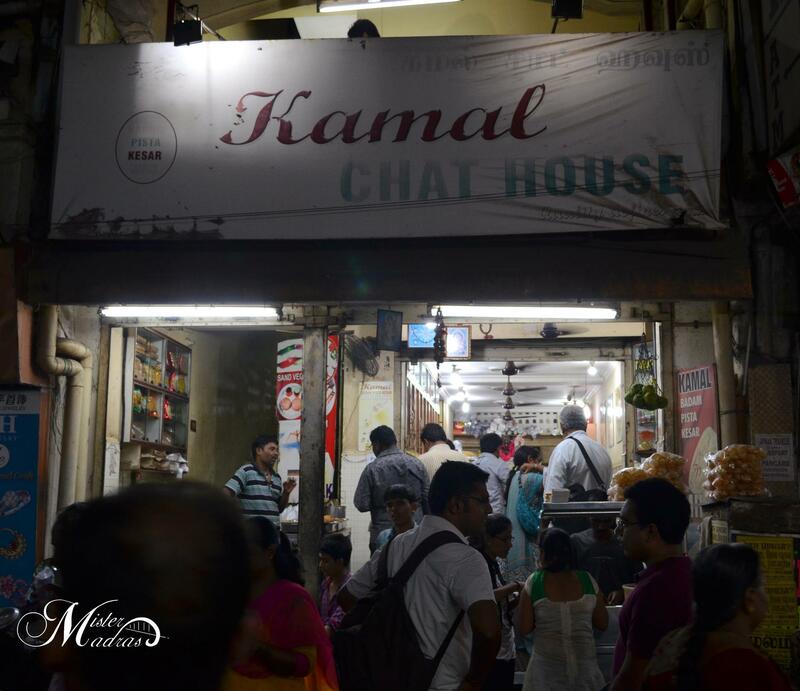 Kamal Chat House (Which shouldn’t be confused with Kamal Pan House) is probably the first eatery one might find in Mint Street and this modest looking shop is famous for it’s array of chat items. The narrow shop showcases an extensive list of dishes which makes it a place packed with hungry dwellers. 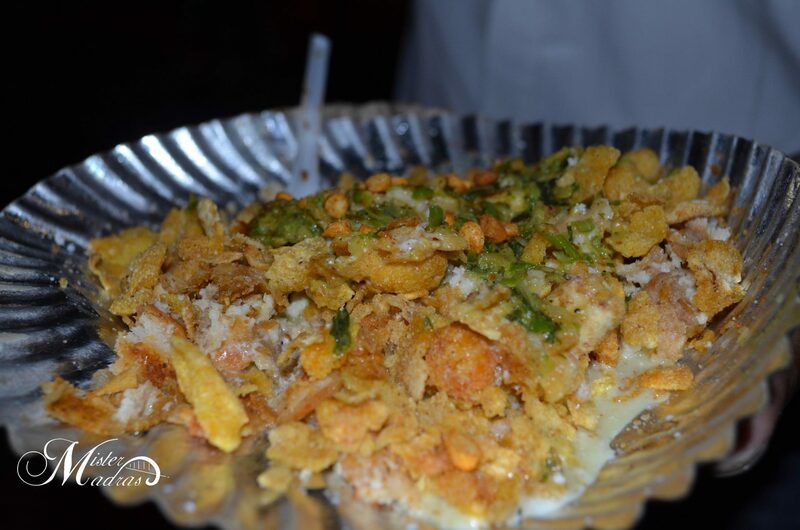 What’s more famous than the chat items are their Jalebis which are made hot and fresh right before our eyes. 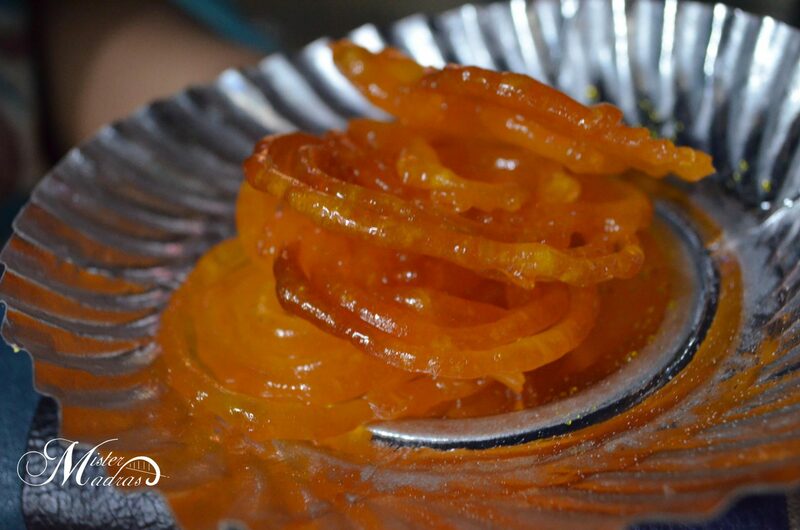 There can’t be a tastier sweet than Jalebi when had piping hot with the sugary syrup dripping as we sink our teeth into it. A portion costs Rs. 30. 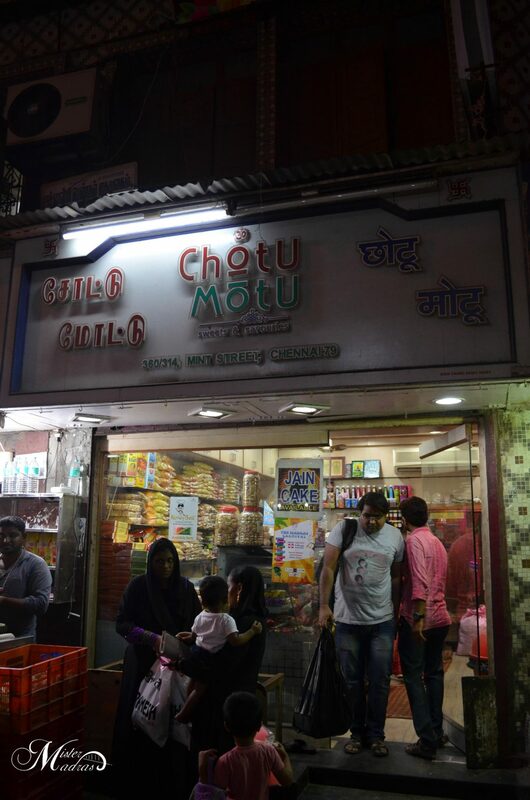 Choto Motu is a sweet and savoury shop that specialises in Jain cuisine. They have a retail outlet which also has a sandwich shop outside and there’s a chat counter behind the shop which can be accessed through an alleyway next to the sandwich shop. Since most of us were a bit full by then already and we had a lot more places to cover, we decided to just stick to one item. 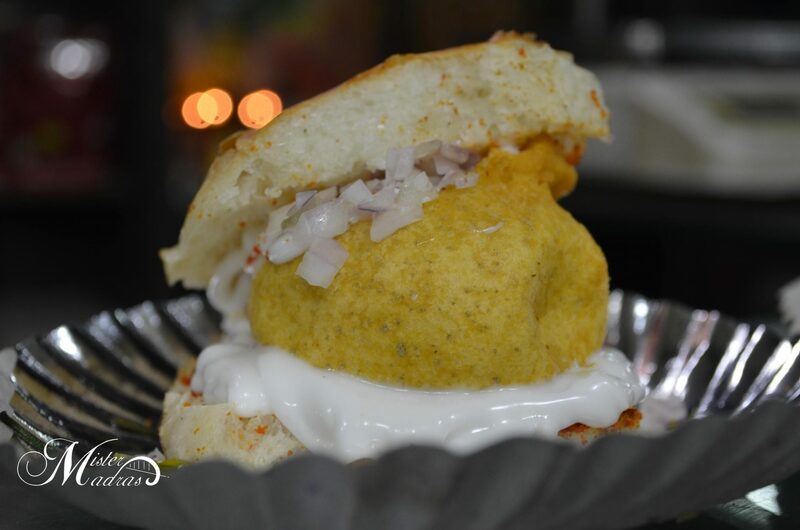 Dahi Poori was what we got and it was served beautifully with a colourful garnish. 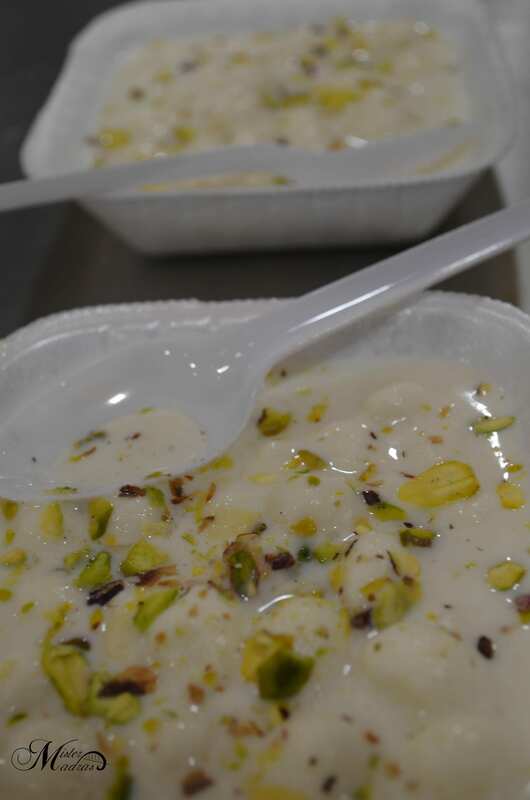 It costed Rs.80 which is expensive and on par with prices quoted in shops like Shree Mithai and Gangotree but the taste was absolutely amazing and it was actually better than the Dahi Papdi Chat we tried in Kakada Ramprasad. To top that, they have a seating area which has a couple of plastic chairs beneath a fan studded ceiling. These kind of ambience is a luxury during such walks and I guess that substantiates the price tag. 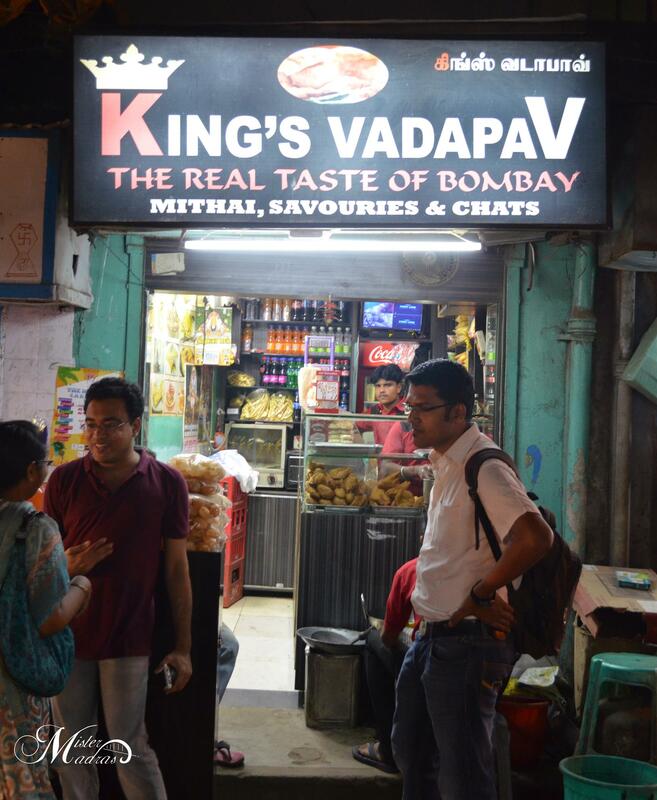 Yet another eatery that will be in everyone’s must try list is King’s Vada Pav. 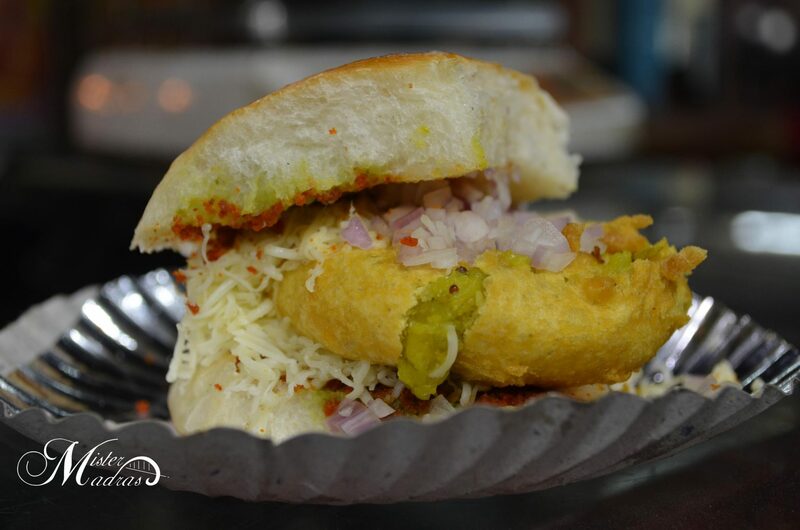 Touted as ‘The Real Taste of Bombay’, they’re famous for what they’re named, Vada Pav. And Oh Boy, are they good with it. They have a number of varieties to customise our vada pav and the options are really interesting. We opted for a Mayonnaise one, a Cheese one and a regular Vada Pav. 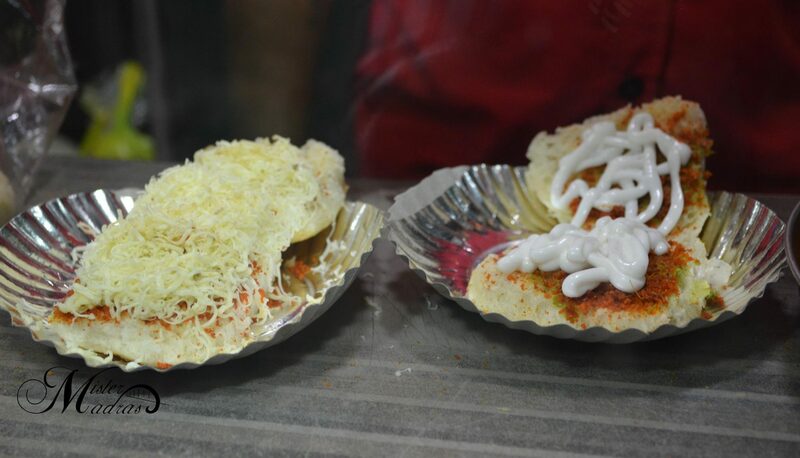 The Vadapavs were excellent and that spicy powder they generously sprinkle before closing the baap of burgers does the trick in bringing out that spice rush as we bite into it. We loved it unanimously and it’s no wonder they’re in the list. Ajnabi Mithaai Ghar is a place that doesn’t need much of an introduction. There are some places that are made famous because of the fact that they are in Sowcarpet and then there are places like Ajnabi which makes Sowcarpet famous. 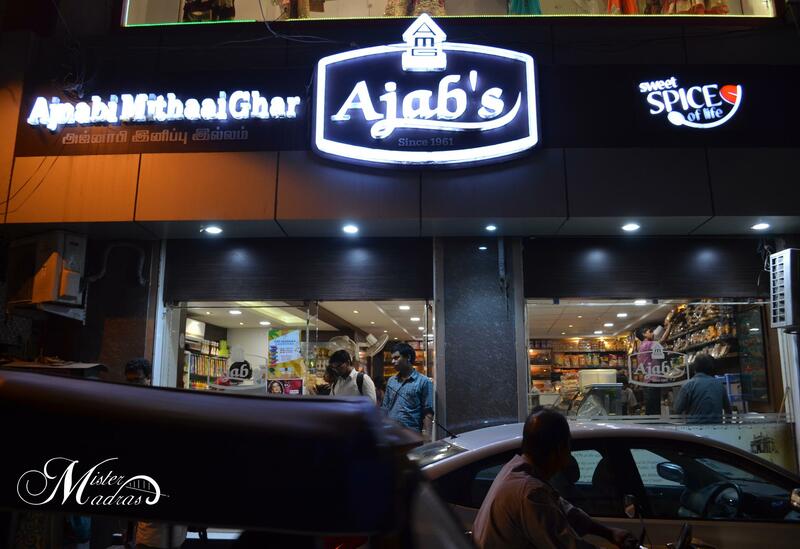 With decades of being in the industry and with branches across the city to stand as a testimony to their success, Ajnabi is indeed the ‘Mithaai Ghar’ of our city. We wanted to try their Fafda and Khandvi which was recommended by many but they weren’t available. So we opted for our favourites and sure shot winners, Kesar Ras Malai, Anguri Malai and Khakra Sandwich. They costed Rs. 25, Rs. 50 and Rs. 70 each, respectively. For that price tag, it certainly did give a great value for money . Also known as THE Kachori shop in my dictionary, Maya Chats has always been the place for some delicious hot Onion Kachoris. 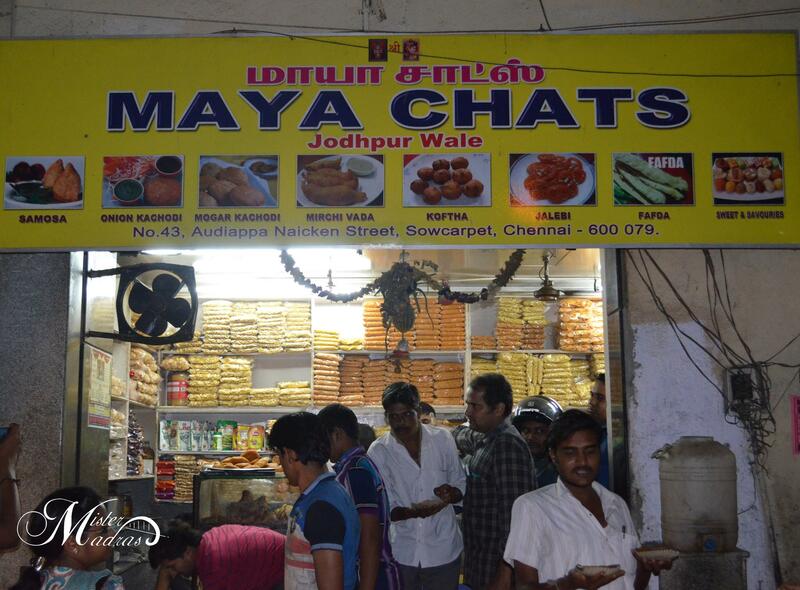 Located in the further most part of our walk, Maya Chats is famous for their savoury items which sell like hot cakes. 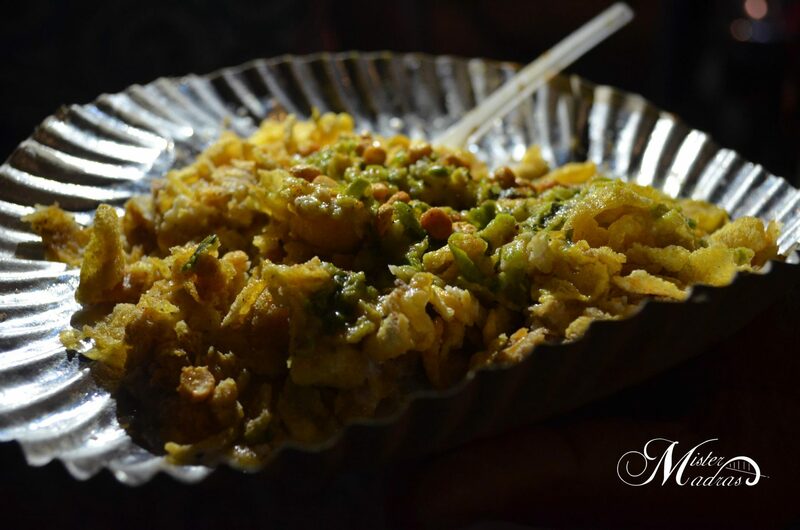 But they are better known for their Onion Kachoris which aren’t easy to come by in our city and the fact that they’re made right in front of us and served piping hot with chutneys as dressing only makes it more amazing. Priced at a modest Rs.20 per piece, this is a dish that everyone wants to have more than one serving. Ironically I’ve come to know that this is the item that most of them who come on food walks end up taking as parcels back home. 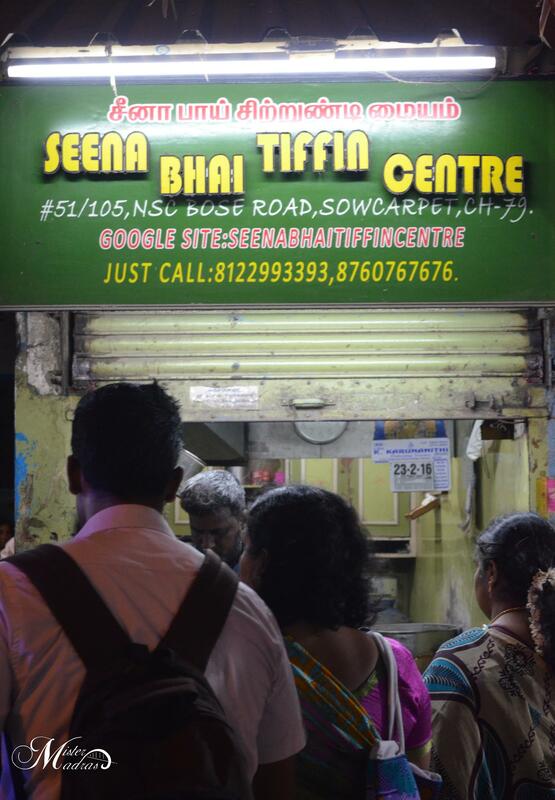 Undoubtedly one of the most famous eateries in this list, Seena Bhai Tiffen Centre is also probably the only one that serves South Indian food. 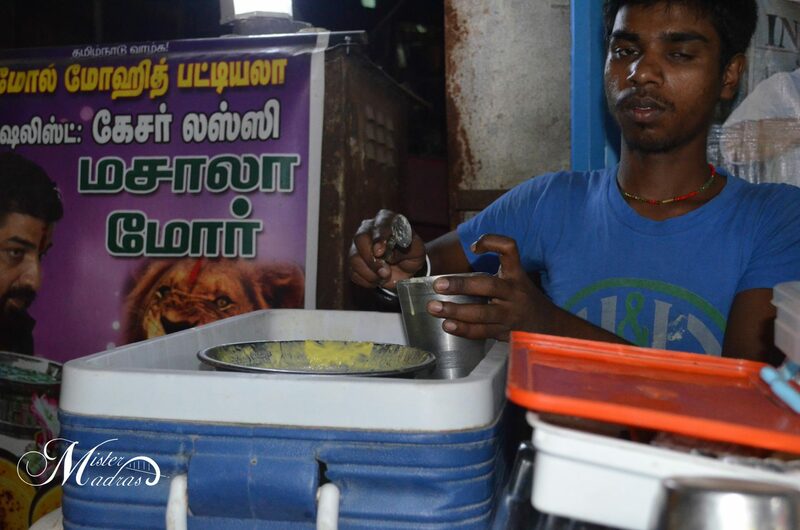 They’re famous for their Ghee Oothapams and Ghee Mini Idlis which are topped with Gun Powder. Couple them with their runny chutneys, what you have is a match made in heaven. Priced at Rs. 50 each for a small portion and considering the fact that they aren’t nothing more than a street food joint, it might look like a costly affair. But for the quality ingredients used and for that heavenly taste, it seems worth all that money. And that’s how our tiring yet fun filled food walk came to an end. We missed a number of places owing to time and the fact that we were completely stuffed. Here is a list of the most important joints to check out on your next Sowcarpet Food Walk out of which I covered most. Saturday evenings are the best time for food walks because during weekdays, Sowcarpet is extremely busy and jam packed. Wading through waves of people is what makes one more tired rather than the general walking. Using public transport to reach Sowcarpet is the easier option when compared to own modes of transport. In case you are using your own vehicle, a two wheeler is strongly recommended as finding a parking space for it is much easier than a car. Walk on the sides of the road. Sowcarpet is known for its narrow roads and not all who drive through it are those worth having a driving license. Carry as much drinking water as you can as the walk will definitely make you thirsty and the quality of water served in some eateries aren’t hygienic. I’d recommend a one litre bottle each. Plan a route using maps to make sure the walking distance is kept minimal. I strongly recommend this map http://bit.ly/MintStreetFoodWalk . At least on your first visit, stick to just the must tries in each place as eating too much in one place will hinder your ability to try the other eateries. A food walk isn’t a place to check your appetite. If getting takeaways, keep that place as the last one to visit as it might keep the food warmer for longer. Sowcarpet Food Walk isn’t just for friends or youngsters alone. 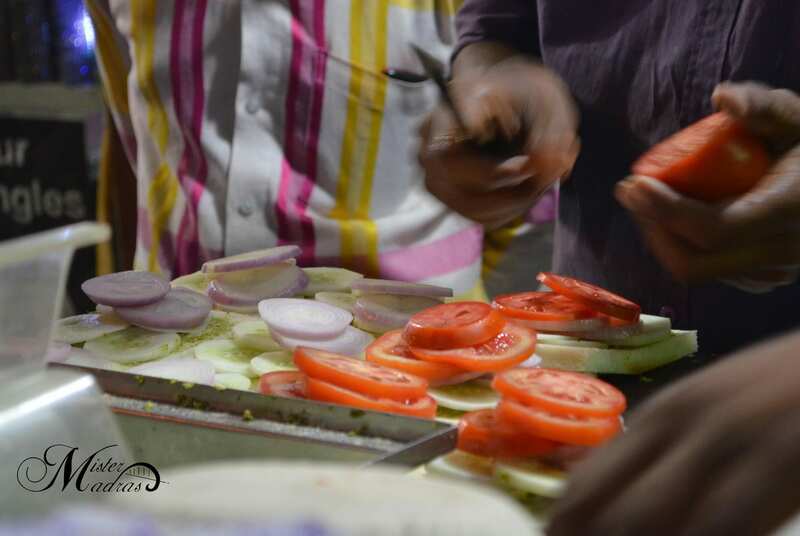 Apart from food, there is a lot of things such as fresh fruits and veggies, clothes, temples and other such places that makes Sowcarpet an unique area of our city. Going here as a family on a long Saturday evening walk is an excellent idea. Trust me, your mom would love this place. Be careful with your valuables. Carry just the essentials and be extra careful with your DSLR camera if you’re taking one. If theft isn’t your concern, hoards of people swaying in all possible directions any time should be one. And finally, not exactly a tip or a trick but almost all items you try here would be served in disposable containers. Kindly use the provided bins at each eatery and don’t litter the streets. A special thanks to Mr. Sridhar Venkataraman, one of the admins of Chennai Food Walks who is instrumental in organising many such food walks and for being the man of databases. It’s his maps and list of must tries that guided me on all my food walks and it would’ve been very tough if it wasn’t for these lists which are the fruits of his laborious expertise. All the above mentioned details are an account of my own experience and preference. 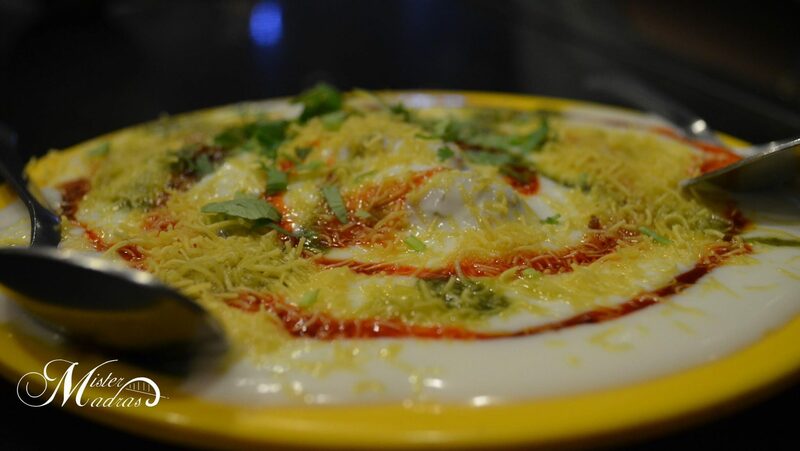 As an individual, it might not exactly fit your taste buds and hence use this post as a reference rather than a list of sure shot dishes that are sure to let you attain food nirvana. If you’ve read this post till this line it definitely means you have so much time to kill and it makes you perfect to plan you next food walk soon. Happy eating !!! Thank you so much.. This was really helpful and had an awesome Saturday food walk.. Thank you, very useful article, I’m coming to Chennai (from UK) for a wedding close to Mint Street, and this article has convinced me to spend a few days exploring Sowcarpet before the wedding. Ha ha, glad to know that 🙂 good luck!